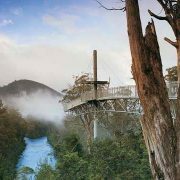 Carolyn and Richard Green have been exploring the Australian wilderness in their helicopter for the past 20 years. Carolyn has written the following story about a recent trip they made to Forrest, in the Nullarbor region of Western Australia. 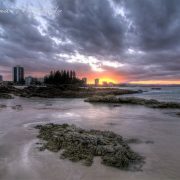 You can see more of Richard’s photography at his website. It was a daunting job for two people. The list of responsibilities was endless. The airstrip facilities, the refuelling, the old Bureau of Meteorology site, the remaining houses, the generators, the pumps, the sky camera… The list went on and on. A baptism of fire if ever there was one. Grant and Rona were putting a brave face on it, but after being there for two weeks were beginning to realise the magnitude of what they had undertaken, if only for a period of 2 months. 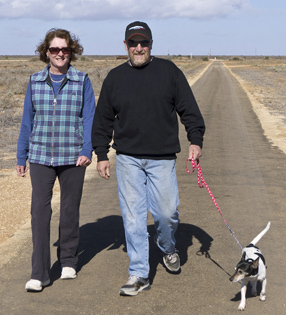 Their usual home was on acreage outside Adelaide, and they had made the decision to come here to the middle of the Nullarbor Plain as a favour to their friends, Claus and Tania, who had been the managers over the previous year, and were keen to have a couple of months R & R before returning for a second year in the job. That in itself was unusual. Past experience showed that those who took this job rarely stayed for more than 12 months. Like a lot of remote places it was not a dearth of social life that was the problem. There was a steady stream of people coming and going, sometimes expected, sometimes unexpected. But, along with the remoteness, the challenges of this harsh environment were considerable, as were the skills required to do the job. Grant and Rona had driven there, in their own vehicle, bringing their small dog Java, all of 30 centimetres high and as cute as a cupcake, with them. The final access was along 120 km of unmade road. Over time, exposure to the onslaught of a passing parade of tyres had worn away the powdery soil from around the numerous limestone protrusions and the road surface was in continual decline. The limestone, like lumps of exceedingly hard concrete, just jutted up more stubbornly and become more lethal with each passing vehicle. The long trip had caused damage to the engine of their hefty 4WD, which, no two ways about it, anyone would have reasonably assumed was more than man enough for the job. But now the engine lay, midway through surgery and awaiting parts, in a dilapidated workshop in a corner of the old hangar. Parts which, when they eventually arrived, were often wrong. So the whole process of ordering had to begin again, followed by the frustration and suspense of waiting for the next weekly delivery by train to find out if this time the correct items had been despatched. The sheer inaccessibility of this location meant that no matter how keen a person may be to problem-solve, the logistics of actually getting the materials here to do the maintenance required meant the wheels turned slowly. And there’s the rub. Well, one of them anyway. The remoteness. Add to this the extremes of weather. 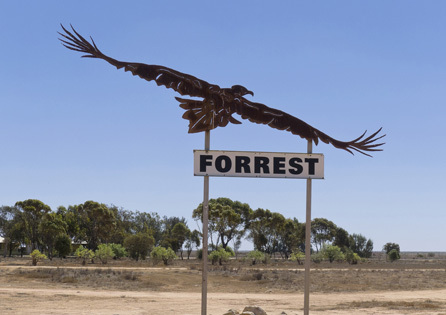 Situated out on the arid and virtually treeless Nullarbor Plain (Nullarbor: meaning ‘no trees’), and totally exposed, the irony is that this place is called Forrest, which, in spite of the spelling, conjures up images of abundant trees. Not necessarily images of the stalwart explorer and first Premier of Western Australia, John Forrest, who led an expedition across the barren plain in 1870, and provides this unique outpost with its name. 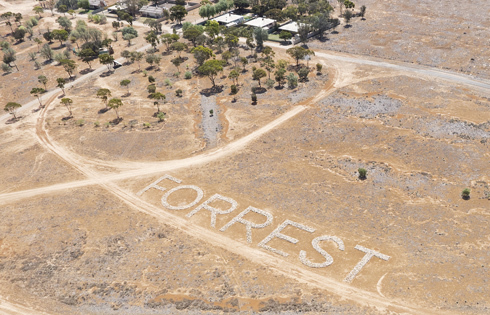 Looking at one information site about Forrest I note the first line of entry under the heading ‘Access to Forrest’. It states: ‘Forrest can be accessed by plane, train, and automobile.’ This was our first visit to Forrest, but we did not use any of the three methods mentioned. We arrived by helicopter. Strategically speaking, Forrest airfield is vitally important. 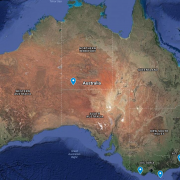 Located partway across the Nullarbor, it provides an alternate runway – large enough and long enough to accommodate a Jumbo jet – should there be an emergency landing required for any aircraft flying between Adelaide and Perth, or Alice Springs and Perth perhaps. It also enables smaller aircraft, with limited range, to get fuel, and is used by the military, as well as the commercial and private sectors. We had set out 2 days earlier from Sydney, destination Perth, and with plans to explore some areas we had not previously been to, such as the coastal region south-west of Perth, as well as some of the National Parks and remote areas to the north, and going as far as the Pilbara. We have been making trips into wilderness areas in our helicopter since the beginning of 1991, and are very familiar with the parameters of flight planning, and the limitations imposed on our explorations by the requirement for fuel, as well as, on occasions, by unpredictable weather. Our original flight plan had us camping that night on the cliff tops of the Great Australian Bight but, when we had landed there earlier that day, the wind force was too strong to even consider putting up our tent. Instead we stayed just long enough to allow Richard to take one of his detailed panoramic photos of this dramatic coastline. His photo captures the essence of the fragile heathland but provides no hint of the strength of the wind gusts. So we headed for Forrest, a day earlier than intended, arriving towards the end of the afternoon and in increasing headwinds. The next leg of our trip would be the longest. We wanted to get from Forrest to Kalgoorlie. The conditions would need to be favourable otherwise, even with our normal fuel tank and our 300 litre auxiliary fuel tank fully filled, we could fall short of our destination, which would be somewhat embarrassing. We checked the weather on the computer and the forecast wind speeds were already too high to allow us to continue that afternoon. We were stranded. Grant called the house to let Rona know there would be 2 extra mouths to feed. Unable to erect the tent we had a valid excuse to sleep in luxury, in a real bed in a house. We gathered a few things together for the short drive to ‘town’. Picture if you will a length of tarred road. Along one side are several houses lined up neatly with fully fenced back yards and low fenced gardens facing the street. On the opposite side of the road is a grassy park. Rather dry grass admittedly, but there nevertheless, as were also a variety of beautiful shade trees – obviously planted by someone with a love of unusual eucalypts. We were shown which house we would be staying in, and it was an odd feeling standing next to a row of freshly laundered, fully furnished, but otherwise empty houses and being told ‘this one is yours’… There were actually six houses in the town, and five were empty. Grant and Rona occupied the other and we would be dining that night with them. Later, at the appointed time, when we walked the few short steps along the road to their home the streetlights were on, and two lone vehicles were parked outside. After meeting the dog, we had made the acquaintance of the entire town. We were just starting dinner when headlights emerged unexpectedly from the darkness. Two initially were followed soon after by two more. They belonged to four off-road motorbikes and their exhausted riders, who were looking to stop for the night. They were directed to the facilities at the weather station, where they could roll out their swags. We assumed if we got away early next morning we would be up and out before the winds had time to pick up, and when we woke at first light it looked promising. But it was the lull before the storm for the wind quickly picked up, and the forecast on the Met site was atrocious. Undaunted we took off, climbing to nine and a half thousand feet to try and find a level that would minimise the headwind. But, when the wind on the nose increased to fifty knots, we realised it was useless. The ground beneath us barely appeared to be moving. We turned to go back and to my surprise Forrest airstrip was still within gliding distance. Obviously our stay at Forrest was not yet over. In fact the forecast predicted the winds would continue for another three days. We battened down in our ‘new home’ and watched through the windows as the fine dust was whipped into the air and on the horizon the sky was tinged with red. (My sister later told me that over the following couple of days the cars outside her house in Melbourne were covered with a layer of red dust.) Conditions were hardly conducive to exploration of the local area. Apart from a bicycle ride to the airfield to check on the helicopter – a fast ride there and slow walk pushing the bike into the wind on the way back – and a visit to the Met site to meet the motor bikers and see the collection of memorabilia there, we were housebound. That evening we had another fine home-made meal with Grant and Rona, and were joined by the four riders. They had used their day to sort out a problem with one of the bikes, and were making the most of the opportunity to rest their weary bones. After riding from Adelaide over various remote offroad tracks they would be starting for home early the following morning. With Grant, Richard and myself also keen riders, it didn’t take much guessing as to what the main topic of conversation would be that night. And, true to form, there were plenty of stories. We well related to the ‘flight planning’ required to make a trip such as theirs. They had many more constraints in relation to what they could carry on their bikes than we had with the helicopter. Next morning I woke again at first light, in time to see the motorbikes depart. I watched until the last dust trail disappeared in the distance. I envied their departure and suspected the likely highlights of our day would be watching the windsock and train spotting. 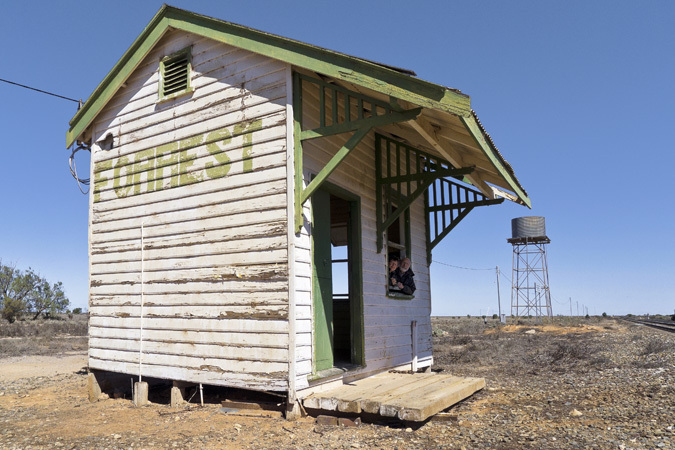 The Transcontinental Railway runs through Forrest, and is one of many sidings on the rail line across the Nullarbor, distinctive as the only remaining township where travellers can still purchase accommodation, meals and fuel. 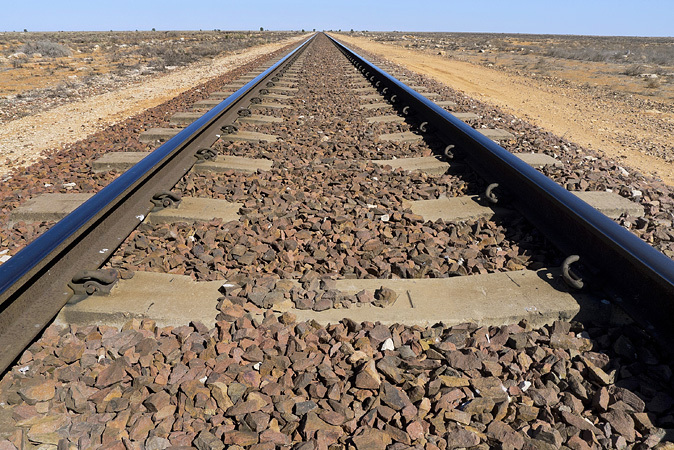 The rail traffic is mainly a parade of lengthy freight trains, and the Indian Pacific, which comes through four times a week, and delivers the weekly shopping and mailbag each Monday. In spite of their size the trains made little noise. With a continual welded rail process and diesel locomotives, there was no clacketty-clack to herald their arrival, just the occasional toot. One somehow just sensed their arrival in the siding, or their steady passing with their hundred odd carriages in tow. Grant however had a better suggestion for the day, and knocked on the door to ask us along when he went to check the Telecom tower. It was the start of a tour. The wind was marginally less aggressive than the previous day, so we set out slowly in the ute – there being no such thing as a fast drive on any of these roads. When finally there, Grant made his regular check of the generators while we searched for fossils, not an uncommon find out here on this vast slab of former seabed. Just a stone’s throw away we diverted to another odd building standing some way off, and looking like a sort of round concrete bunker. It housed, on its flat roof, a meteorite camera. Together with two other ‘all sky cameras’ on the Nullarbor, it takes a single time-lapse picture of the sky throughout the night. Researchers can subsequently calculate the path of any fireball that has been recorded, and search for the meteorite on the ground. From there we drove to Forrest railway station, the last remaining station on the line across the Nullarbor, a pretty, but dilapidated, one-room building. Not far away are the living quarters for the workmen who come regularly to check and maintain the rails. And nearby are various generators supplying power to the town. On the other side of the railway track out beyond the airport there is a quarry and the remains of a huge crusher, used to produce the gravel base for the runways. Also in the vicinity, and the main highlight of the day’s tour, was the Forrest tip, otherwise affectionately known as ‘Bunnings’. This was a veritable cornucopia – a one-stop shop for the creative local handyman. Everything brought into Forrest, and no longer in use was here… somewhere… waiting to be recycled if necessary. All it took was an enterprising collector to find and convert the piece he required. Fortunately Grant was an enterprising collector, as were many others before him. We wandered, and wondered at the bits of hardware surrounding us in various degrees of disintegration and decay. The two great levellers, oxidization and the desert sun, had over time created some fine sculptures here. The entire tip was a curious collaborative installation. We took a drive out along the enormous runways, and then wound up our tour with a wander around the historic 1930’s hangar – a solitary but still stylish landmark although, sadly, now in need of major maintenance. It was hard to imagine that it once stood beside a smart guesthouse, set up by WA Airways as overnight accommodation for passengers. That night we dined again at our favourite local. As usual there was no shortage of dinner guests. This time two couples returning to Perth from travels in their huge custom-built camper vans. It was not only aircraft operators that availed themselves of Forrest’s fuel facility, and this time Grant & Rona had been expecting them. Apart from the one we were staying in, we had only seen inside Grant and Rona’s house. They sent us to look at another. They had previously been the homes of the Met Office workers and their families. Now they provide accommodation for travellers, and are homely and inviting, ready and waiting for their next guests, but the vibes of their past life are still palpable. It was impossible not to be conscious of the different people who had lived, worked or grown up at Forrest over the last almost 100 years. Much of the material evidence of that history is now gone. The fettler’s houses were razed to the ground some time back. Their jobs were made redundant by upgrades to the tracks, and the last traces of the post office are its crumbling foundations. Even the remaining houses require critical ongoing maintenance. Weather observations have been taken there since 1930, and the Bureau of Meteorology’s weather station was fully operational from the early 1950’s till its closure in 1995, when it was replaced by an automated system. A few years ago it was set up as a museum, with its original equipment and various other memorabilia put on display. Passing campers are now the main beneficiaries of its shelter and facilities. Feeling confident that the following day we would be on our way again, we wandered the environs of the town once more. We checked out the railway line and the town name laid out carefully in lumps of limestone beside the track. Where the road crosses the railway a visitor with an artistic bent has cut the silhouetted form of an eagle from an old water tank. It’s a fitting and beautiful symbol to ‘fly’ there, for there is no shortage of magnificent wedge-tails cruising above in the air currents as the dog discovered soon after her arrival. As is common with small dogs, Java had no concept of her own size and in her feisty little mind felt no qualms about tackling ‘big stuff’ if the opportunity presented itself. The local game consisted mainly of rabbits and dingoes, invariably in dreadful condition as a result of an extended dry spell. The desiccated remains of their bodies littered the landscape. On one occasion, soon after they arrived, Java gave chase after a dingo, deaf to Grant and Rona’s shouts to return. By the time she finally reappeared and was racing back a wedgetail had lined her up as a likely meal. The eagle flew nearer and nearer and was closing in when Grant rushed to meet her in time to foil its kill. At the end of those first two weeks, Java’s paws were shredded by the sharp rocks that made up the local landscape. They were accustomed to far smoother surfaces. The following morning, as anticipated, we were on our way again with an early morning departure and a following wind. A month later, our travels out west completed, we flew back to Forrest. I was keen to find out how Grant and Rona were making out. This time, flying west to east, we had the infamous westerlies on our tail. We made excellent time from Kalgoorlie to Forrest, with ground speed readings, on occasion, in excess of 190 knots – over 350 km per hour – very fast for a helicopter. Grant and Rona were there to greet us, cheery and hospitable, and by now familiar with the ropes. They had been thrown in at the deep end, had survived and were doing a terrific job. Even Java’s paws had toughened up. I thought this outcome epitomised the business of living in the remote and extreme conditions of a place like this. Whilst interesting and challenging, it is ultimately about survival. 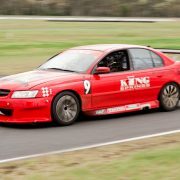 Yes, Grant was still awaiting parts for the 4WD – this time a set of tappet shims. Once again the order had been unsuccessful. Rona too, had had her hiccups with ordering supplies. But with two more weeks to go they had somehow juggled the workload and were still laughing. The three short days we had spent with them had made a lasting impression on us both, and this place of contrasts had grown on us, simultaneously harsh yet fragile, peaceful yet unforgiving, barren yet beautiful. It had afforded us a brief haven and a new perspective on our own life, and was a place we would not forget. I used to work at the met station way back in 1972 for a few months, there were about 27 people there, not a lot to do unless one was an avid stargazer. Shame the met station now closed.